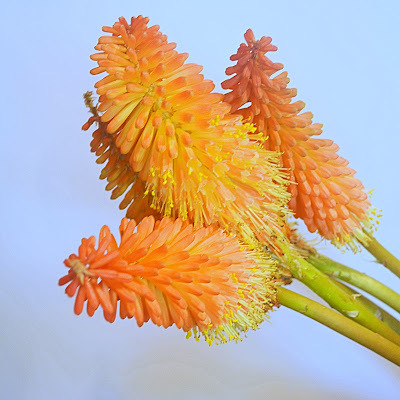 This week, our chosen flower is the Kniphofia. Also known as Torch Lilies or Red-Hot Poker, these flowers are typical from the South of Africa. They are very unique for their narrow shape, beautiful bright colours and also for the fact that they can grow up to 5 ft (1.5m) tall in the field or garden. Kniphofias, or Tritoma in Latin, are very seasonal flowers. Turning from yellow to orange, and then to finally scarlet, Kniphofia is the perfect flower to light up your garden and home! Want to know a fun fact about Torch Lilies? Butterflies and Hummingbirds love them!